If you have a picky eater who doesn’t like meat, but you are concerned about protein intake, this article is for you! 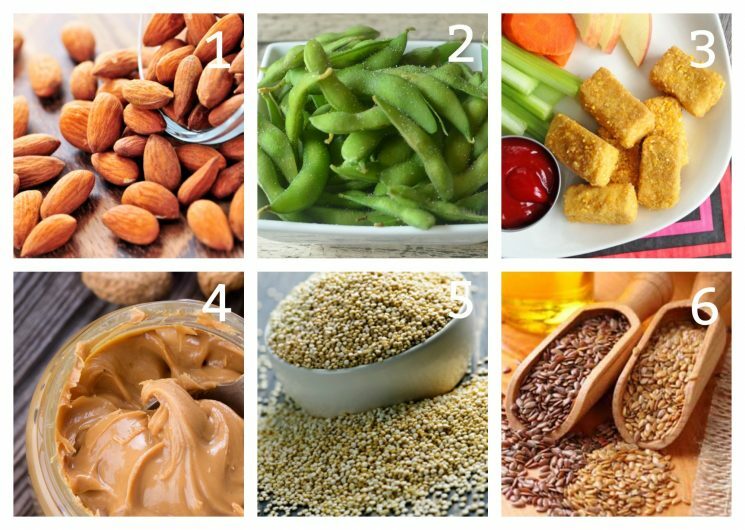 Our favorite non-meat protein sources! “My 7 year old has gotten to the point he doesn’t want meat at all and if it’s on his plate, he saves it for last and it’s cold and hard to chew. I don’t know what happened”. There could be a variety of reasons kids might be resistant to eating meat. It could be that it’s difficult to chew. Your child hasn’t found the way they like to eat it yet. They could also finally make the connection between their love for animals an what they are eating. It’s not necessary to eat meat to get the adequate amount of protein for a child. We are breaking down the protein requirements for kids, and how you can meet them, even if your kids aren’t eating meat. Protein is the building block of our muscles. The latest recommendations are 1/2 gram of protein per pound of body weight. 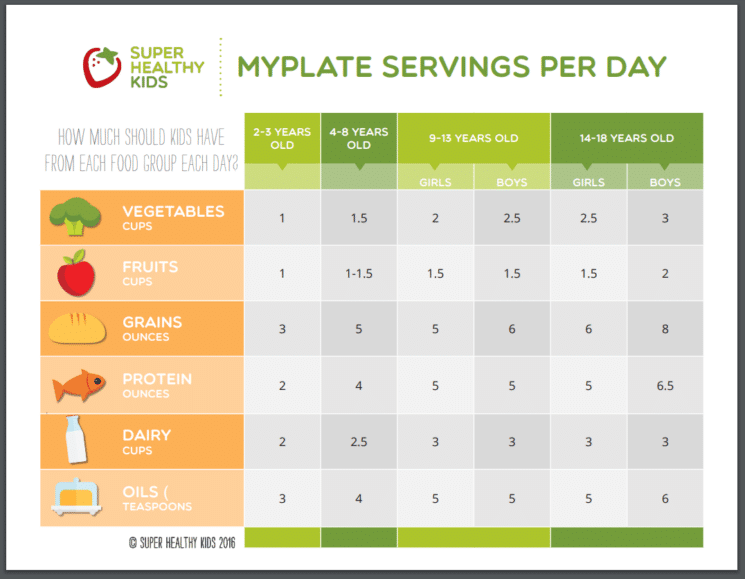 So, if your child is 50 lbs, 25 grams of protein per day is sufficient for all his needs! A 100 pound child would need 50 grams of protein. 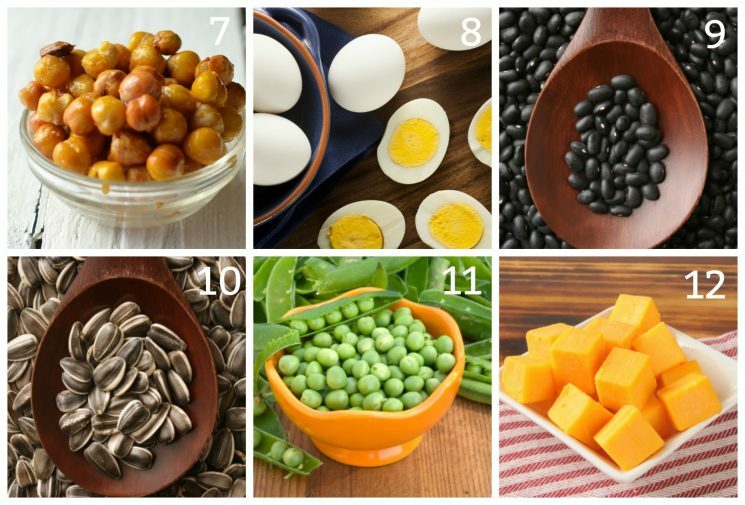 The following is 12 of our favorite non-meat protein sources that kids actually like! Edamame is a favorite snack for kids! Heat it up and let them pop them out of the pod, add the shelled edamame to stir fry, and try it in a dip! We have many ways kids will eat tofu! Try these crispy baked nuggets, in a smoothie, or combined with pesto pasta! Blend your own peanut butter, add peanut butter to smoothies, in oatmeal, spread on sandwiches, dip with apples, or even in popsicles! Quinoa is one of very few plant foods to have the complete profile of all 20 amino acids.We have so many ways kids love quinoa! Try fried quinoa for dinner, cheesy quinoa cakes for breakfast, Quinoa coated chicken nuggets for lunch, quinoa granola bars, or even quinoa pizza bites! We’ve long used flax seed for all sorts of recipes for our kids! The flavor is not overwhelming and it can be incorporated into foods like baked goods like muffins, smoothies, and even french toast. If your kids haven’t tried Roasted chickpeas yet,we have 4 flavors they won’t be able to resist! Another easy way to eat chickpeas is blending it up to make hummus. You can dip hummus with breads, pretzels, vegetables, or even use it as a sandwich spread. Really get the kids excited by making this special CHOCOLATE hummus! Color eggs all year, not just at easter time. It’s more fun for children to eat a pink or purple egg, than a plain white one. We like “one eyed monsters” for a healthy breakfast tip . We cut a circle out of the middle of bread, spray both sides of the bread with butter-flavored cooking spray, lay the bread on a hot griddle, and crack the egg in the middle of the bread. Cook thorougly on both sides. Also grill slightly the cut out circle of bread and serve both the “face with the one eye egg” and the extra bread. Stuff a pita pocket with scrambled eggs. A pita can be easier to handle and hold. Pita pockets are also high in fiber. Some kids don’t like the taste of eggs, but they love french toast. Mix two to three eggs in a shallow dish. Add a touch of cinnamon, some vanilla extract, and some low-fat milk. Dip the slices of whole-wheat bread into the egg mixture. Make sure to get a healthy coating of the egg mixture to ensure maximum egg benefits. Beans added to Mexican dishes like tacos and cheesy chili is usually a favorite for kids. But we have also found kids that enjoy their beans blended into a dip, regular dip. When serving beans over rice, melt some cheese on top. Melted cheese always makes things tastier. If your kids play baseball, they’ve likely had a bag of sunflower seeds in the dugout! Kids who can take the shells of their own sunflower seeds usually enjoy them. Grab shelled sunflower seeds and add them to trail mix, granola bars, or sprinkle them on salads. For the tastiest way to do sunflower seeds, blend them up for a dip or spread! Have you ever seen those kids that eat frozen peas! I always thought it was hilarious when toddlers pick up peas, fresh or frozen, and gobbled them up. Now, I like to add peas to pasta, salads, potato bar, pea pesto,and shepherds pie. Finally, and possibly the most kid friendly high protein food has got to be dairy. Greek yogurt and cottage cheese have the highest amount of protein at 20 grams per cup! Mix cottage cheese with fresh fruit for a breakfast or a snack. Use Greek yogurt to make popsicles or ice cream, smoothies, or fruit dip. There really are so many more, and we could have made 12 sub-categories out of the dairy section alone. 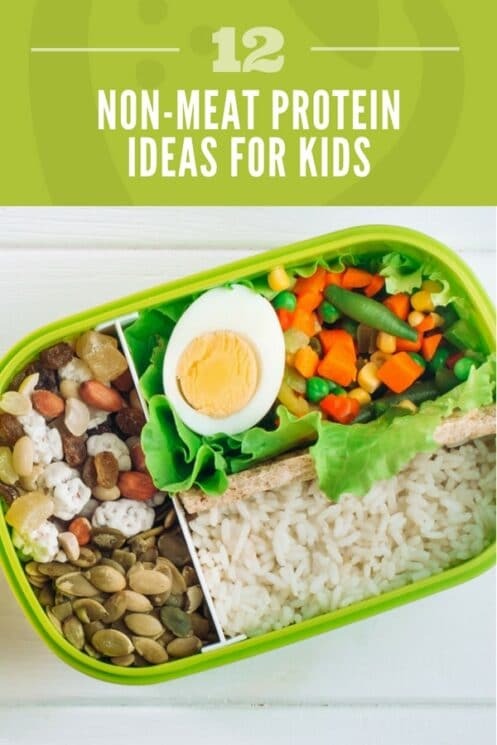 But, we’d love to hear some of your favorite non-meat protein foods that your kids love, or how you use some of the foods we recommend in your families diet. Maybe if you kid no longer likes meat they are super smart! Maybe they have made the connection to the fact it’s a dead animal. Thank you for the non-meat protein list!